Earlier in my Newark Memories, I recalled my pre-World War II experience reporting the wrestling matches at Laurel Garden on Springfield Avenue for the Star-Ledger. In that memory, I also recalled the life of Laurel Garden as a boxing and wrestling arena. Laurel Garden had been a popular Newark site for the staging of professional boxing and wrestling matches since the 1920s. My earlier Laurel Garden "Memory" went back to the 1920s and ended with the final Laurel Garden boxing match on May 30, 1953, when Brooklyn-born Joey Giardello outboxed middleweight Hurley Sandler in a nationally-televised event. On that New York Times page from 1886, there was an account of a two-round hard-glove fight in the back room of a Newark saloon1. I am guessing that boxing was then illegal in Newark, but that word had gotten to the prestigious New York paper of an impending fight in Newark, and The Times had had a reporter on the scene to witness and report on the event. 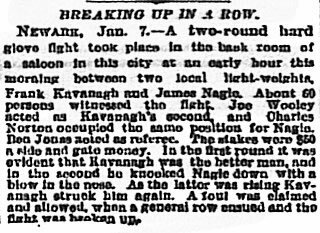 NEWARK, Jan 7 -- A two-round hard glove fight took place in the back room of a saloon in this city at an early hour this morning between two local light-weights, Frank Kavanagh and James Nagie. About 60 persons witnessed the fight. Joe Wooley acted as Kavanagh's second, and Charles Norton occupied the same position for Nagie. Don Jones acted as referee. The stakes were $50 a side and gate money. In the first round, it was evident that Kavanagh was the better man, and in the round, he knocked Nagie down with a blow in the nose. As the latter was rising Kavanagh struck him again. A foul was claimed and allowed, when a general row ensued and the fight was broken up. Charles Norton, who was the second for fighter James Nagie, was a Newarker who two years earlier in 1884, had retired from boxing as "lightweight champion of the world." He made his home at 17 New Jersey Railroad Avenue, with his wife and three daughters, and lived there until his death. After his retirement from boxing, he had opened a saloon in Newark. It is likely that the fight described in the 1886 Times report took place in Norton's drinking establishment. He owned and operated the saloon up until the time of his death. The 1880s were the first years in which regulations were applied to the boxing sport. Previously, when there were no regulations, fights sometimes involved feet and knee kicking to all parts of the body, as well as mauling, scratching, and throwing...often resulting in serious injury for one or both boxers. In 1886, the Marques of Queensbury gave his support to a new set of rules, which were named in his honor. These rules limited the number of three minute rounds, eliminated gouging and wrestling, and made the use of gloves mandatory2.